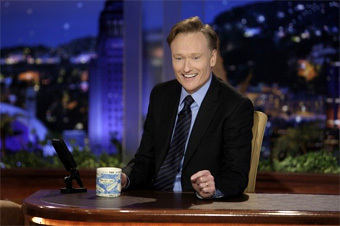 Conan O’Brien, seen on The Tonight Show in his 2009 debut, is headed to TBS. On Monday, Conan O’Brien and TBS announced that a deal had been reached that will bring Conan back to television this November. I was initially surprised to hear that TBS would be Conan’s future home (I don’t recall it being mentioned as a possibility in most of the prognosticating over the past few months), but in thinking about it, I think it’s a potentially good fit for both Conan and TBS. TBS has long been trying to brand itself around the tagline of “very funny,” and the cable network’s recent attempt to get into the late-night talk-show game with George Lopez’s show makes Conan a logical next step for them. Landing Conan is a score for TBS. For Conan, this might be a good fit as well. The whole Tonight Show debacle showed that the audience drawn by his somewhat more bizarre brand of humor is, while younger, undeniably much smaller than that drawn by Leno’s bland appeal. Conan’s ratings were about half of what Leno’s were. And with all that’s happening with the splintering of the TV audience in general, perhaps cable is the place for Conan (or anyone) to be in order to be himself and do the show he wants to do. Conan always wanted The Tonight Show as his dream job, but that was under a TV model that every day seems more and more on its way out. It didn’t work out, and it’s time to move on. Moving on perhaps means acknowledging where the best fit for Conan might be given the future of television, which, simply put, is cable. Word is the Fox possibility was going to be a tough sell to their affiliates and was by no means guaranteed, because many of the affiliates were already invested in running lucrative reruns of popular sitcoms during the timeslot where Conan would’ve gone. Conan is a talented guy, but his personality probably trends toward an audience more in tune with his quirkiness, and this audience is perhaps what he should be targeting rather than the broader, older Tonight Show audience. He can probably more easily do this on TBS. Now he can continue to be who he is and deliver the material he wants to deliver without the worry of having such a high ratings bar to clear. And he can probably be somewhat more edgy than he was on NBC in the Tonight Show timeslot. This is an interesting move, and I’ll be looking forward to his new show. He’ll be able to let loose a little more on cable, which is a definite plus when it comes to Conan. Glad to see he’s landed a job so quickly after the Leno disaster, but he’s a talented guy, so it was pretty much inevitable. P.S. The link to this article from the main Jammer’s Reviews site is broken. The link from the main page leads to an error page, but the link from the “latest posts” on the error page works.